Purple horsemint leaves smell like citrus, taste bad to deer. 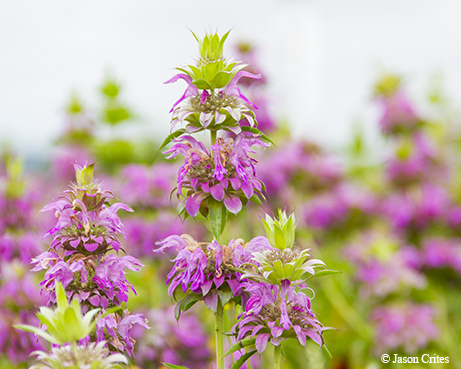 Bees and butterflies love purple horsemint — deer and mosquitoes, not so much. Tall blooms, appearing in late spring, add splashes of vivid color to fields and roadsides. There’s a lot to like about this native wildflower. Horsemint is easily recognized by its distinctive flowering habit. Flowers are arranged in circles or whorls about the stalk, and they appear in ranks set off by layers of leaf-like bracts. The clusters look like miniature pom-poms, stacked three to six on a stem. Several species of horsemint are native to our state; Monarda citriodora is the most common. It’s found all over Texas and in most of the southern United States. Like many wildflowers, purple horsemint is a winter annual. Seeds germinate in fall, and the plants lie low until warm weather triggers a growth spurt in spring. Mature plants stand up to 2.5 feet tall with four-sided stems and long, narrow, downward-curving leaves. Short, stiff hairs cover the stem. Individual flowers are small and typical of the mint family, with five petals fused into upper and lower lips. Petals are lavender, pink or whitish, often with purple spots. Bracts under the whorls may turn a deeper purple. Although it can live in partial shade, purple horsemint prefers the sunshine. It will grow in sandy or rocky soil, and easily tolerates dry, hot weather. The colorful blooms attract butterflies, moths and hummingbirds; they’re especially enticing to bees, both wild and domestic. Most home-grown Texas honey contains nectar from at least one species of horsemint. Other common names — lemon mint, lemon beebalm — refer to the citrus-like fragrance of rubbed or crushed leaves. The plant contains volatile oils that don’t taste good to browsing herbivores, which makes it a good candidate for a deer-resistant garden. The spicy scent also discourages biting insects. I always try to gather horsemint for my May/June camping trips. A pinch of leaves in the campfire helps keep mosquitoes away, and I usually hang a bouquet of drying flowers in my tent. Rubbing fresh or dried horsemint on the feet and ankles offers some protection against chiggers and ticks.